A real gem of a little book. 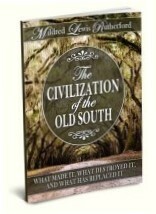 The author was witness to life before the Civil War and lived to write about the birth of modernity. (1916) She compares the personal, non-materialistic social order of the Old South, with the impersonal, materialistic modern era. She saw the decline of community and the rise of individualism.